Yes, I realize this makes for $7.50 dinners. Meat at Costco is more expensive than sale prices at grocery stores, and many argue that the quality is better. That explains that! Mix and Match Meals – because of the bulk purchasing, this is really a game of mixing and matching ingredients. The ingredients are very common and work in a wide variety of recipes, so feel free to use them in other recipes besides those listed below. I would expect you to have some ingredients needed for the different recipes in your pantry, like spices, soy sauce, etc. In the recipe/ingredient list below, I’ve only included the ingredients from the Costco purchase list. Swap Idea – save a few bucks and get a 10 lb. bag of rice and not the quinoa. I just like quinoa, and I like that it has a higher protein content than rice. Make rice with corn, black beans, etc instead of the quinoa. You could also serve the rice alongside the taco/tortilla meals too. As you’ll see if you really analyze this chicken scratch, I forgot to add the peppers to the bottom portion where I priced everything out. So I added them as optional as it would push the total cost to $155 if you added them. Leftovers – you will have lots leftover too…including a jar of spaghetti sauce, lots of quinoa, jar of salsa, several pounds of potatoes, a ton of Parmesan cheese, and smaller quantities of other ingredients. I did not reflect these “leftovers” in the total cost, so it would really be $10-$15 less than $150!!! While we have all the content available to piece together from the site, we thought we’d simplify the experience for you with this printable. This printable has the complete grocery shopping list (with south TX Costco prices), as well as complete recipes with ingredients broken down to make it easy for you. All in one place y’all! This is worth gold when it comes to saving time in preparing to shop and cook your meals. Well, maybe not gold…but way more than $2.49!!! Please don’t forget to check out the other 7 plans and their various features in our new E-Store. You might also like our join the $5 Meal Plan family and get weekly meal plans delivered to your inbox each week! Please sign me up for your free email updates, Thanks!! I used your shopping list and went to Costco yesterday. Here’s to 20 meals without me having to plan it out!! Thank you soooooo much!! i bought both the printables but viewed them on m phone. Then when i went on my comp to print them, the page wanted me to purchase them again. How can i get new links to print them? I paid for the download last week and love it! Whatever bugs previous posters mention have obviously been all worked out. I live in CA and our pricing is definitely different. Still, we followed our standard shopping protocol: Grocery Outlet first, followed by Costco and then Raley’s. Our total expenditure for the meal plan recipes was well under $150. Some things were higher (like the chicken breast) so we bought chicken tenderloins instead. We found the ground beef at the Grocery Outlet for $1 less per pound and so on. So far, we’ve eaten the beef broccoli stir fry, breakfast tacos and the ranchero chicken. We definitely doctored with the seasonings and ingredients (we get all produce from a local farm so lots of substitutions in the veggie dept.) to suit our family’s tastes but having a basic framework for reference has been an immense help. Thank you for all of your efforts…I am enjoying the benefits! I am allergic to avocados. Do you have a good substitute to use without completely omitting the ingredient? Thank you! Question for you: do you use iBotta and Favado? Brooke – Favado shows you where the best deals are in your local area at your favorite stores. Ibotta is a savings redemption program where you submit a scan of your receipt for different offers to earn cash back. Do you have anything like this with less meat and chicken or just no chicken in the recipes/grocery list for costco? I am actually VEGAN. I have 4 kids ( minus 7 month old ) so 3 kids and 2 adults (me and husband) and we all dont like the same things. My son who is 4 will not eat meals anymore. He wont touch green beans, any kind of rice other then White basmati, jasmine or normal rice. He will only eat pasta with nothing on it or red sauce, ketchup, white sauce. No veggies in it. The only way he eats vegetables are raw cut up dipped or just raw. He will eat pizzas of any kind. he likes chicken and meat but we dont buy chicken often as i dont eat it and its expensive. Husband now only buys 1 big tray of ground beef for tacos on days hes home from work. He wille at vegan or vegetarian for lunch at work. Im having a hard time making a 14 meal plan for $180. I keep grabbing a bunch of recipes with similar ingredients but its never enough. We like eating more then 2 plates at a time. we are not over weight by any means. the foods we eat a lot are Vegan. most of us dont like meats anyway. My son eats a ton of white bread in 2 days for sandwhich. oatmeal is gone in a few days. Natalie, google cauliflower pizza crust recipe, maybe your son will try that one, and you can make it vegan friendly. Cauliflower can also be substituted for rice and potatoes in many recipes. I have a friend with a picky-eater child, she searches all over for different ways to incorporate vegetables into food, mostly into her baking! When you say meals are for a family of four, does that mean the recipe makes four servings or that it feeds four people until no longer hungry? Also, are these intended to be complete meals or only the entrees? Oops! My second question was answered by reading the plan. Hi! I just bought all of the ingredients for this and wasn’t sure what you do to prepare the meals. Do you make them all and freeze? Kimberly, don’t precook anything. Put everything in the bag raw and freeze. Put them in the fridge the night before or in a bowl of warm water then pop in the slow cooker. I’d love for anyone who has used these recipes to post their results. Good recipes + good food quality = great food. Unfortunately, not all recipes are created equal. Any reviews out there? So far we have had the Chicken Tortilla Soup rated a 10!! We got some low salt fritos and poured it over the top of them to make Frito Pie, we have had the beef stew Rated 6 the hubby liked it, the child didn’t and I was fine with it. We are now eating the Italian Chicken Stew Rated a 9. We all love it. Here are my thoughts and tips on some of the recipes if you are still interested . . . the recipes are just OK. Some of them are pretty bland and needed salt or other seasonings added to them (like the beef and bean tacos.) The ingredients were good quality, but I would not make most of the recipes again. The baby carrots are horrible when cooked in a slower cooker. Buy regular carrots and use those. If you freeze the meals, the potatoes will turn brown if there is air in the bag when you defrost it. Make sure they are totally submerged in the liquid or use a vacuum sealer instead of a ziplock for those meals. My chef/husband cringes anytime someone mentions putting raw chicken in a slow cooker and cooking it for an extended period of time. It’s not safe to have chicken at that low temperature for that long (a few people mentioned trying that in some of the comments I read.) I would recommend cooking those recipes in a pressure cooker (although your vegetables will be mush) or in the oven in a large pot.) If your really have to use the slow cooker, definitely do it on high!! I did use the slow cooker on high the first time to give the recipe a chance. The chicken breasts were dry. I would probably substitute dark meat in that recipe next time as the meat wouldn’t dry out. I ended up making about half of the recipes as I felt they were too bland or as we didn’t really care for them. I used the rest of the ingredients and made most of the other menu items using my own recipes. The reason why this plan works so well is because she’s done a great job of cross utilizing ingredients. The more recipes you can use an ingredient it, the better and the more cost effective. I don’t regret trying out the meals and love this site for ideas, but would only use the menu items as ideas and use my own recipes with more flavor next time. It definitely motivated me to plan meals around key ingredients and to cross utilize ingredients more. This is awesome! Just to confirm, 20 meals for $150 is for a family of four? It is just my wife and I so this could stretch to 40 meals. 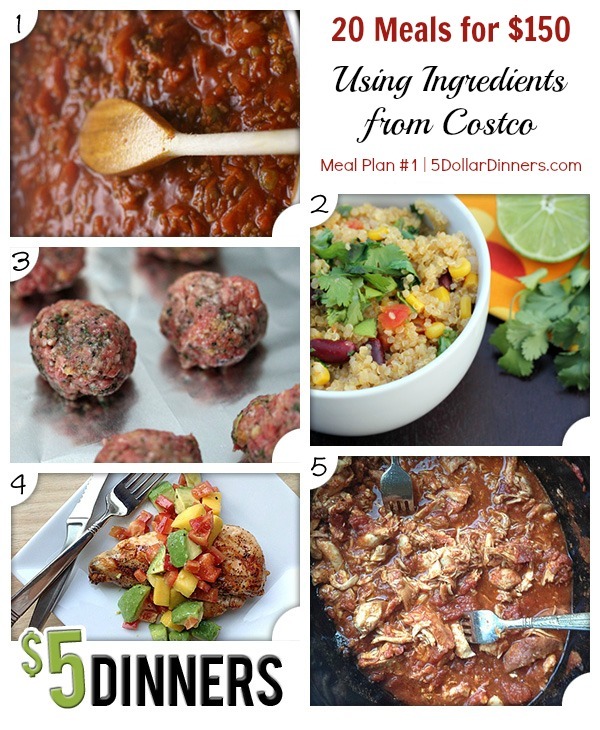 I purchased the Costco meal planner recipe package one but am unable to download it. Can you help me? Thanks so much for this! I was a little bummed to see how different prices are more almost a year later and in a different region! Im going to keep my eye out and try to stock up on the staples at lower price and find the meat on sale to keep it under the $150 for the second time! Since I had so many of the ingredients on hand, this first go around it was under $100. Can wait to try it all out! I love the idea of your concept, but have to tell you your site is WAY too confusing. Too much information splat everywhere, buttons to click to buy, links to other people’s sites and advertising, confusing numbers… “Costco Plan #4” is part of “Printable Pack #1” or something like that. I’d like to give this a try but as busy as I am, I need things to be clear, concise, and straightforward. I’m hesitant to “buy” anything, because, frankly, I’m not sure WHERE to start. Any help?? Really? I read through it once. It’s as clear as could possibly be. I ordered this $5 pack last month and have yet to receive anything…. whats going on? I have the order recite that says it was positively taken out of my account. I’m not sure how these are $5 (in this case $7ish) if it doesn’t include the sides. Maybe these should be called $5 entres. I am considering buying – but I see NO answers/replies to these questions in DAYS!!! Is anyone monitoring this site to reply to questions? I would need assistance to find out for -2- people as well. Also, the concern of not being able to download the information is a big concern – I know it’s a small amount of money, but hubby and I watch every dollar that goes out – hence the need for low-cost and variety in our meals! Please respond to the questions and advise if there is any concern to the above issues about downloading the Costco pack. I was thinking the same thing Kathy. I would also like to purchase but not if there is zero support for download issues, etc. I hope to see some response soon so I can have confidence to purchase and begin planning. I agree! I just came across this website today for the first time and was so excited, but a little concerned with the lack of response. It’s a shame too, because it seems like such a neat concept but I am all about good communication. I paid but now says safari can’t download, furthermore says it will delete after 5 attempts. Sounds like a good idea but it’s not, glad I’m only out $3.00. Will leave comment with BBB next. Hi, I just purchased the plan and was able to download it just fine on my desktop. (to answer above questions) I’m wondering if you have the nutritional value calculated anywhere or if I need to input myself to determine. Would be nice to know before you purchase what kind of foods/meals – bought the second Costco plan as well and all the canned tuna meals as well as the dairy are making me regret the purchase. 🙁 And, finally, will you be offering a dairy free meal plan? After reading some of these questions, i wanted to share my experience so far in hopes of helping to answer some of them. I think it’s important to sit down with the plan and read it several times. Think about how your family can use it, what you might want to add or subtract. Use it as a guide. It’s a good guide but you can’t just go on auto-buy or auto-cook. Thanks for sharing your insight Stephanie. I didn’t feel the need to purchase any of the lists for sale, yes they definitly could have made my shopping and cooking experience easier but with that said I just wrote down the Costco list with my other shopping list and I have written down all the reciepes from the affiliated sites. It is super simple if you’re willing to pick up the pencil. Once our family gets through these 20 meals if we really like them then at that time I would consider purchasing the lists and recipe cards to make it easier for future trips to Costco. I’ve been excited to try this, but I’m frustrated that several ingredients were left off the grocery list. I realize you assume some pantry items will already be on hand, but chicken thighs and flank steak? Those are not pantry staples. Your list is incomplete…also, instructions on how to put together the second of a double meal would be helpful….these ingredients are not going to stay fresh for 20 days until I make the last meal. A couple of the doubled meals have freezer instructions, but not all. No ingredients are left out. Some have been modified from the original recipes to fit in with the ingredients available to purchase at Costco. If you purchase the printables then everything is spelled out in detail. genuinely excellent material for visitors. to lifelike, handcrafted creations, but most people still wonder, “why”. a strange dude in a dress. I can’t click on the link to access the recipes? Where are the recipes for the list? I went and bought everything but now can’t find the detailed recipes for the meal plan list that you mentioned.